A young Killucan team were outclassed by holders St Lomans, who registered a commanding 2-15 to 0-6 win with the influential John Heslin contributing seven points on his return to action. Killucan were gritty throughout, but Lomans maintained their efficient start to the campaign. TJ Cox and the excellent Conradh Reilly were Loman’s goalscorers, while Ken Casey, Paul Sharry, and Kelvin Reilly also added some nice scores. The Downs eked out a narrow, but crucial 1-9 to 0-10 success over Coralstown-Kinnegad. Adam Loughlin’s goal was the decisive moment, but Luke Loughlin’s six point haul was vital in such a tight tussle. Luke Folan and Joseph Moran fired over points for The Downs, who have claimed wins over Killucan and Coralstown-Kinnegad since losing to standard bearers St Lomans on the opening weekend. Tyrrellspass are perched on the top of the Group One table alongside Lomans following a narrow 2-8 to 1-10 triumph over Athlone. Despite trailing by 2-7 to 1-5 at half-time Athlone were much improved in the second period narrowing the gap down to a single point. Tyrellspass, though, were able to close out the deal meaning Athlone’s upcoming fixtures with The Downs and Killucan will be revealing. Mullingar Shamrocks eventually shrugged off Maryland’s spirited resistance to chalk up an important 1-13 to 2-7 success. Beaten by Garrycastle in their previous encounter, Shamrocks needed to summon a response and that is exactly what they did by earning the full complement of spoils. Shamrocks had to battle hard for this win. Brendan O’Reilly and Dean Moore rifled over early scores for Shamrocks, but a Kenny Kincaid goal gave Maryland hope. As the interval approached Simon Quinn, Patrick Fagan, and Moore registered points for Shamrocks as the teams went in level, 0-7 to 1-4, at the interval. After the restart Shamrocks enjoyed a productive spell as Moore (2 ), Alan Cashman, and Darren Keena nailed points. Ciaran Curley netted an opportunistic goal and while Darren Maylinn replied with a Maryland major Shamrocks weren’t going to be denied. Rosemount proved too strong for St Mary’s Rochfortbridge emerging 1-8 to 0-9 victors. It has been a satisfactory burst for Rosemount, who have won two and drawn one of their matches in the competition. Rosemount are only a point behind Garrycastle, who have stitched a three match winning sequence together. Sean Pettit and David Tone were prominent for Rosemount, who continue to make solid progress. Garrycastle’s form is most encouraging and they cool enough to defeat Castledaly by 1-15 to 0-12. Castledaly did show plenty of determination during the game, but Tom O’Halloran’s first half goal was key for Garrycastle. O’Halloran’s goal ensured Garrycastle led by 1-9 to 0-6 at the turnaround as Castledaly were left reflecting on some costly misses. Eoin Monaghan was effective for Garrycastle clipping two points, while Cathal Mannion, Conor Cosgrove, and Ger Heneghan all landed points. Garrycastle have the cut of a team intent on making a real impact and the recent signs are encouraging. 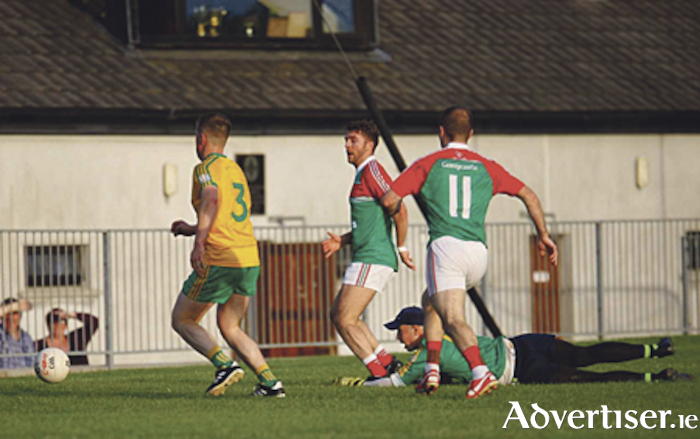 Lorcan Dolan struck five points for Castledaly, who will be seeking to record wins against Maryland and St Mary’s Rochfortbridge in their remaining encounters. A couple of Castledaly victories in those fixtures might be enough to earn a place in the knockout stages from this competitive pool.